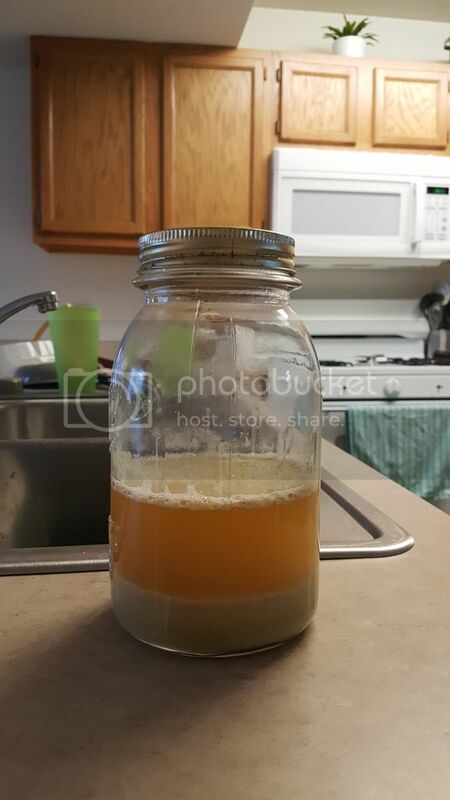 This is my first time washing yeast. This is US-05 at its second wash. Is it looking right so far? I've never done this so I'm not 100% sure what I'm doing. Looks like a good harvest to me. What are you washing with? I've done acid washing on a commercial scale, but for a home brewer yeast is so cheap I wouldn't bother. There's no real need to wash it. Just store it under some of the beer from the last ferment. But, if you want to wash it, go ahead. Look like you're doing it just fine. Just stop that s***, Barry! There's no advantage to it and it's just one more place you have a chance to screw up! Well tell me how you really feel!!! I'm only doing because, well, because. I figure why let all that yeast go to waste. Plus, I just like having beer related things to do in the evening. But you do have a valid point, Denny. One more thing for me to screw up. As for what I''m washing it in, I guess I need to study up on yeast washing. I didn't think there was actual "washing" with any type of chemical involved. I just thought it was the process of letting the yeast settle on top of the trub, move to a new container, and repeat until you are left with basically all yeast. Looks like I have some reading to do tonight. You don't have to wash it to reuse it. I just pour the slurry into a sanitized container and keep it under beer in the fridge til I reuse it. And you're right, what you're doing is rinsing it, not washing it. But both are unnecessary. The brewery I work for simply xfers slurry from one tank to another and they make award winning beers. Stop taking unnecessary effort and put your time and effort into something that matters. You don't have to wash it to reuse it. I just pour the slurry into a sanitized container and keep it under beer in the fridge til I reuse it. ^^^This is the most successful way of reusing yeast - bar none! It's also very easy and quick to boot. Yup. Same thing I do. +1. Stopped rinsing yeast years ago. Thought it was an unneccesary hassle. I notice that some Pro's are washing their yeast with chlorine dioxide with pretty good success. It looks pretty simple when using that active ingredient. Anyone have any experience with it? No because I'm a homebrewer. And what's "pretty good success"....what are they trying to accomplish? What benefits would it have for a homebrewer? Martin, sorry if it sounds like I'm getting on your case...that's not my intent. I'm just sick of homebrewers assuming that everything a commercial brewer does is what they should be doing. Stop taking unnecessary effort and put your time and effort into something that matters. That's precious time I could be using to look for deals on cherry Jolly Ranchers!!! I haven't washed yeast with chlorine dioxide, but it's my preferred brewery sanitizer, and I wouldn't recommend that anyone play around with it at home. A hood is all but mandatory for working with it in enclosed spaces.